The global veterinary hematology analyzers market is prognosticated to foresee a highly competent vendor landscape, with a few leading players holding over fifty percent of the entire market revenue. Transparency Market Research (TMR) has recently published a report that predicts the market to be largely consolidated. Due to high competition in the industry, market participants are obliged to pay attention toward technological advancements in the field. Industry giants are expected to recognize potential through expansion and adopt strategies to hold their market position. The report expects names such as Heska Corporation, IDEXX Laboratories, Siemens Healthcare Diagnostics Inc., URIT Medical, and HemoCue AB to be the key market players. 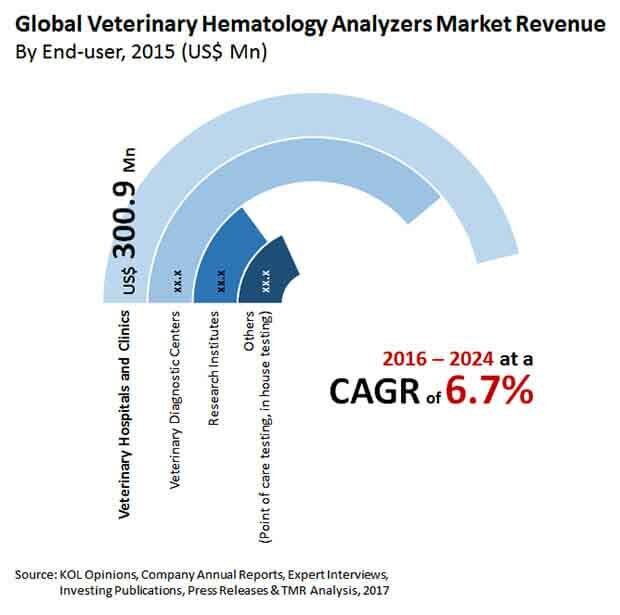 TMR’s report predicts that the international veterinary hematology analyzers market could showcase a 6.7% CAGR between the forecast period of 2016 to 2024. The market stood at US$663.0 mn in 2015 and is projected to reach a valuation of US$1,178.9 mn by the end of the forecast period. The segmentation of the worldwide veterinary hematology analyzers market may be done on the basis of the product type, the analysis perimeter, the end user and geographically. Among the product type segment, table top type of analyzers currently lead the market share in terms of revenue. This segment Table top analyzers held approximately 73% of the market revenue in 2016, and is expected to witness a high CAGR in the coming years. On the basis of the end users, the veterinary hospitals and clinics segment are foretold to showcase a considerable CAGR and maintain a large market revenue share. Veterinary hospitals are equipped with a number of medical amenities for all kinds of animals. The market in North America has been dominated by this market segment on account of various facilities, and is expected to continue being one of the leading market segments throughout the forecast duration. Geographically, the worldwide veterinary hematology analyzers market could be segmented into major regions such as: Europe, Asia Pacific, North America, Latin America and the Middle East and Africa. Among these, North America is prognosticated to retain its top position throughout during the forecast period. Rising number of veterinary hospitals, adoption of pets and strong economic conditions are factors contributing to this region’s dominance. However, the Asia Pacific market is predicted to showcase a tremendous growth rate over the coming years, due to the briskly developing healthcare industry for animals. The rise of nuclear families is witnessing a high popularity of pets globally. With changing climates, there has been an unprecedented rise in zoonotic diseases all over the world. With medical advances and disposable people and organizations are looking for better and sophisticated health measures for their pets and animals. Improvements in diagnostics along preventive health procedures and nutritional awareness is leading to increased longevity of pets. A 2014 survey by Partners for Healthy Pets reports a growth in the concern of preventive pet health care. Pet owners all over the world seem to have become increasingly more responsive to their pet’s needs, and this could be a significant factor contributing to market surge. Rising zoonotic diseases leading to improved diagnostic tests and procedures, and modern pet healthcare facilities are expected to drive the market positively. Recent developments by top market players such as IDEXX, VetScan may also aid the veterinary hematology analyzers market. IDEXX Laboratories Inc., launched th eProCyte Dx analyzer in 2015, which is the first of its kind analyzer that utilizes laminar flow impedance and optical fluorescence for its analysis. Abaxis has developed VetScan, an analyzer that has the capability of displaying a 22-parameter blood count and cellular histograms on a touch screen.